There are many worthwhile things to see and do in Santiago for travellers. A fantastic way to start familiarising yourself with this vibrant and busy city is to pay a visit to the Plaza de Armas, Santiago's central square. Many of the main attractions of Santiago are in walking distance of this classic colonial meeting space. There are also brilliant walking tours with a group called Spicy Chile who offer about three different walks a day to give tourists an introduction to the city. The guides are knowledgeable locals and the tours are free (although tips are expected). There are a number of small but interesting museums in Santiago, the best of which is the Chilean Museum of Pre-Colombian Art, a must-see for those interested in the ancient cultures of South America. Visitors travelling in Santiago with kids should also pop into the Museo Interactivo Mirador, a huge interactive museum with lots of educational activities and play areas. Another deservedly popular attraction in Santiago is Pablo Neruda's home: the late Nobel-winning poet's house is colourful, eccentric and romantic and worth a visit even for those unfamiliar with his poetry. It is called La Chascona, which means Tousled Hair, a name given in honour of his third wife. 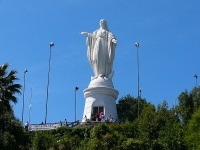 San Cristobal Hill is a must for great views of the city and a refreshing dose of greenery and clean air. Santiago's parks and green spaces are a delight and it is never hard to find somewhere to relax in the shade. For not-so-clean air try the Mercado Central seafood market, a bustling market which offers a massive variety of seafood fresh from the ocean. Many travellers stop off in Santiago as a base for adventures out in the surrounding mountains; it has become a renowned area for ecotourism and you can take your pick of exciting outdoor activities, including skiing, horse riding, climbing and hiking. If you are looking for a more mellow experience of the beautiful surroundings of Santiago then take a tour of the famous wine country just outside the city.